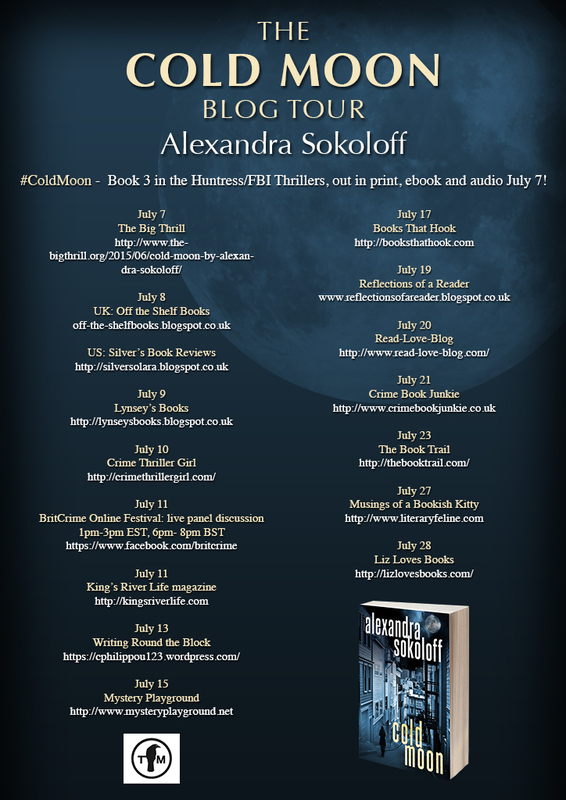 Today I’m delighted to welcome author Alexandra Sokoloff to the CTG blog as part of her COLD MOON Blog Tour. Alexandra is the Thriller Award-winning, Bram Stoker and Anthony Award-nominated author of The Huntress FBI series. As a screenwriter she has sold original scripts and written novel adaptations for numerous Hollywood studios, and teaches the internationally acclaimed Screenwriting Tricks for Authors workshops. Your latest book in the Huntress Moon series – COLD MOON – is out this month, can you tell us a bit about it? Cold Moon is the third in the Huntress series, and I highly recommend that new readers start with Book 1, Huntress Moon, because the action is continuous, really a binge read! – more like a serial than a series. The books are intense psychological suspense, and take the reader on an interstate manhunt with a haunted FBI agent, on the track of what he thinks may be that most rare of killers: a female serial. But here’s the thing. Arguably there’s never been any such thing as a female serial killer in real life. The women that the media holds up as serial killers actually operate from a completely different psychology from the men who commit what the FBI calls sexual homicide. I wanted to use that psychological fact to turn the cliché of the serial killer novel and the tired trope of “woman as victim” completely inside out. Whoever she is, whatever she is, the Huntress is like no killer Agent Roarke – or the reader – has ever seen before. And you may find yourself as conflicted about her as Roarke is. I have to admit, I love a good adrenaline rush in a book (in fact I pretty much require them, repeatedly!). And I’ve always had a dark turn of mind – I’ve always read and watched and written a lot of psychological horror, too. But a good thriller is so much more than that. I agree with Val McDermid that crime novels are the best way to explore the deep issues of society. I’m very passionately political, and I have a lot of social outrage built up from years working with abused and incarcerated kids in the California prison system. I learned a lot about what seem to me to be clear-cut issues of good and evil. And thrillers are a great vehicle to explore the roots of evil in a very emotional, visceral way. As long as you’re delivering great suspense, you can ask the hard questions – in the context of such a exciting story that people don’t even realize what you’re doing until they’re too hooked to put the book down! I’m a total plotter. 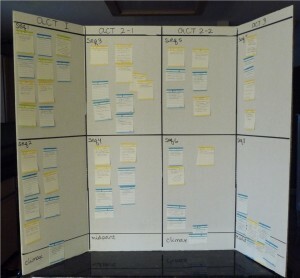 I use index cards and a three-act, eight-sequence story structure grid to start brainstorming a plot. I was a screenwriter for ten years before I wrote my first novel, and the index card method is a very common plotting technique in Hollywood because you have to come up with full story ideas so quickly, sometimes literally overnight. But it’s also the fastest and deepest way I know to outline a novel, and a lifesaver if you’re writing thrillers with lots of subplots. I teach the method in my story structure workshops, on my blog (http://www.screenwritingtricks.com/) and in the two Screenwriting Tricks for Authors workbooks that I’ve written, and I definitely practice what I preach! The trick, of course, is that you have to STAY in the chair. For ten years. That’s not usually what people want to hear. What people want to hear is more like this: Find a system. Read a lot of books on writing, take a lot of classes, and when you find a writing system that makes sense to you, follow it. And then expand on that. There are some very, very good teachers out there, and some not so good, but you have to decide for yourself who is the best teacher for you at a certain time. And of course everyone is welcome and encouraged to check out my Screenwriting Tricks for Authors blog, which I have been told is a gold mine of information for free. Lastly, I have to say – Read everything you can about the options in indie publishing as well as traditional routes to publication. I think the rise of indie publishing is best thing that’s ever happened for writers. It means that if an author is willing to work hard, they have unprecedented access to distribution, and can cut out the often crippling middleman of traditional publishing. It’s devastating to authors how much traditional publishers charge for e books. Indie publishing allows you to control your own prices. I’m both traditionally published and indie published, and that diversity has made for a much larger readership and much more stable living for me. Make sure you know the options before you sign a contract! So much! Of course I’m working on the fourth book in the Huntress Moon series. I’m also starting a new, dark crime series set half in Scotland and half in Los Angeles – I live with the Scottish noir author Craig Robertson, so I have someone to vet the Scottish parts! In August the textbook version of my writing workbooks will be coming out – Screenwriting Tricks for Authors: Stealing Hollywood. I’ve doubled the material from the ebooks, and this version will have ten full story breakdowns. The e workbooks are being used in college film classes and it’s about time I had a full print textbook version available! And I’m very excited to be working with a writer/producer I love and have worked with before to develop the Huntress series into a TV series. I am sick to death of the misogyny in crime series like True Detective. But I also think there is some absolutely brilliant television being made these days, on HBO and Showtime and FX, and I would so love to see a series that gives equal time and depth to female characters and deals with crimes against women and children as the evil they are. We couldn’t have made this happen just ten years ago, but I think finally, finally, it’s time. Huge thanks to Alexandra Sokoloff for stopping by to answer our questions today. I can thoroughly recommend her excellent Screenwriting Tricks for Authors blog and books – they’re packed with great tips. Excellent interview. 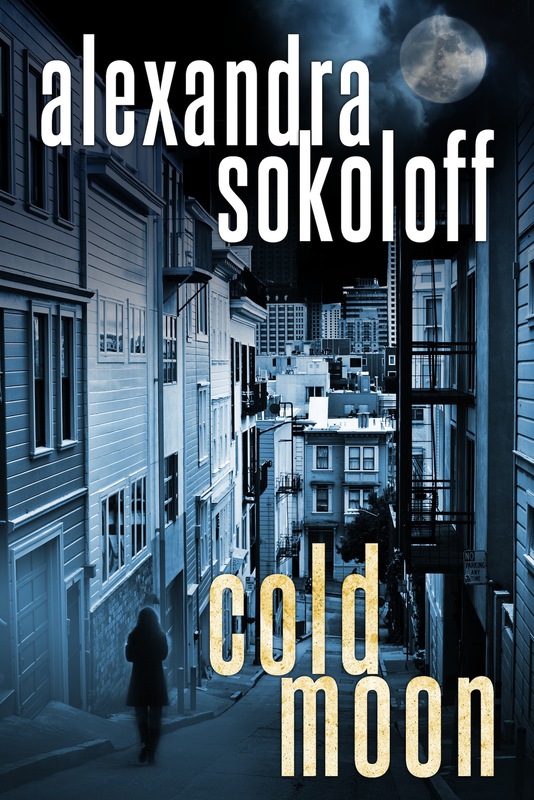 I hadn’t heard of Alexandra Sokoloff but I’ll give her a try! Great news about a fourth book. Can’t wait. Loved this entire series.